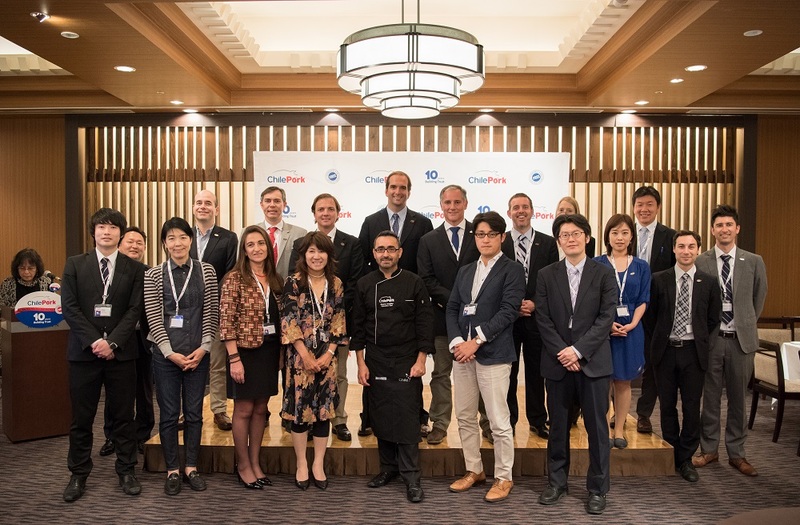 The ChilePork delegation – consisting of the export companies Agrosuper, Maxagro, Coexca, and AASA – opened their activities in Tokyo with a cooking show for a group of Japanese journalists who specialize in gastronomy and the food industry. 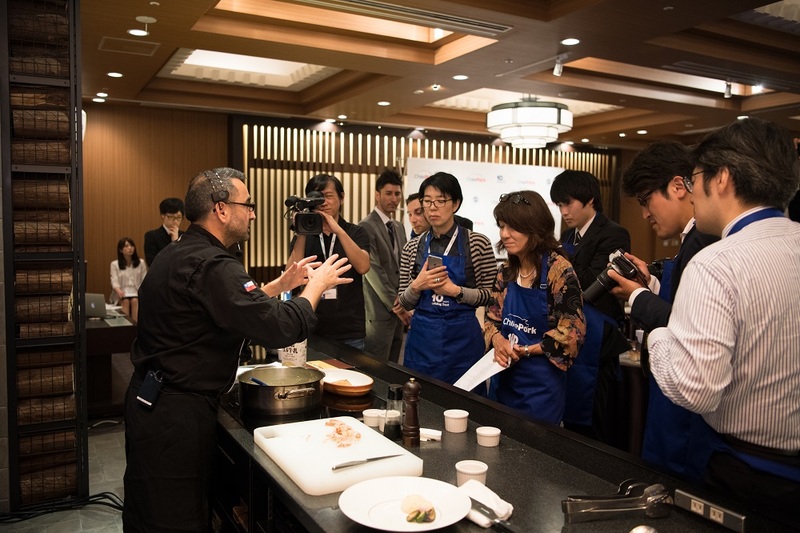 In charge was Chilean chef Ricardo González, who has had a distinguished career in Japan and in international cuisine. Those present highlighted the flavor, versatility, and texture of ChilePork’s meat, qualities and properties which were well demonstrated in a delicious fusion with traditional ingredients of Japanese cuisine. The recipes also included a wide range of other Chilean export products, such as grapes, prunes and walnuts. “As cooks, what we really want today is a product that is reliable, of good quality, tasty, and with a pleasing texture. It is very important for meat to be tender; when we use meat from ChilePork we don’t have to worry about that. It is also a very versatile product, which gives us the freedom to use different cuts and to cook the pork in all sorts of styles and combinations. And it is a healthy food with excellent nutritional qualities,” added Chef Ricardo González. The second event took place in the Happoen Hotel in the center of Tokyo. 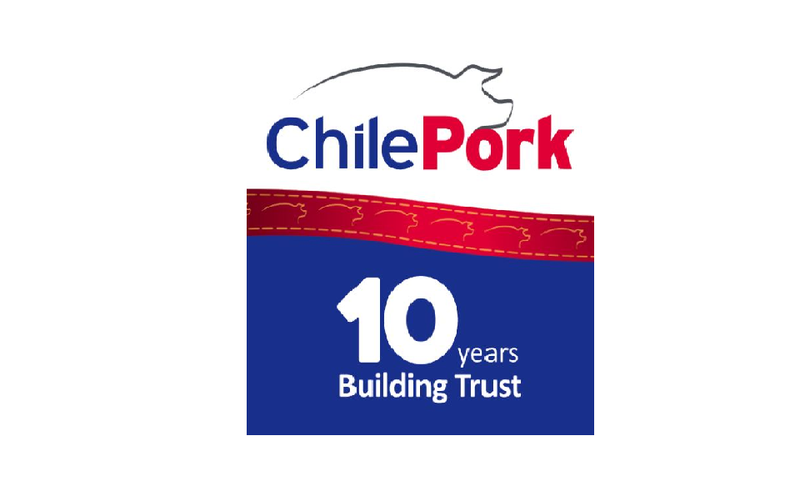 It was chosen for this year’s ChilePork Annual Seminar, which was attended by a record number of over one hundred importers. 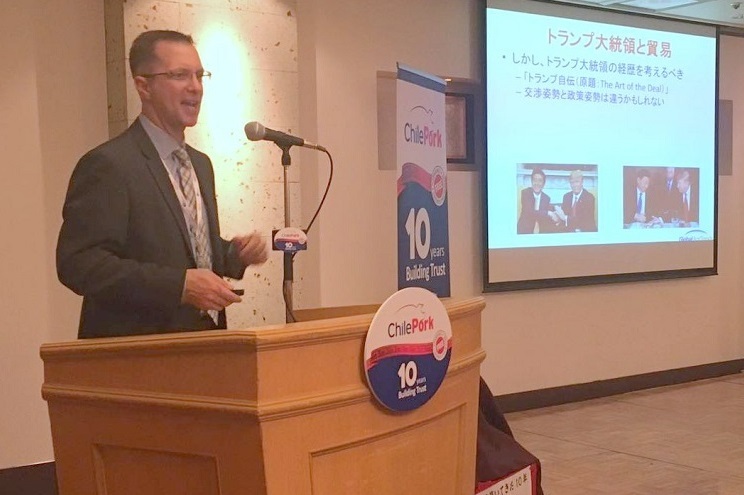 The meeting was opened by the Chilean ambassador to Japan, Gustavo Ayares Ossandón, and the president of ChilePork, Juan Carlos Domínguez. 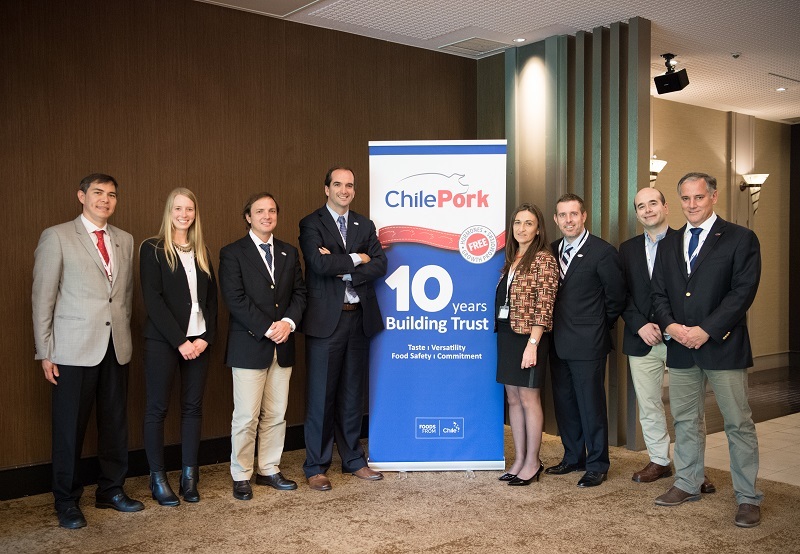 The ChilePork delegation at this event consisted of ChilePork Marketing Director Soledad Valenzuela, Coexca General Manager Guillermo García, Agrosuper Export Manager John Lüer, Maxagro Commercial Manager Jorge Rozas and AASA Sales and Marketing Manager Alejandro Muñoz, as well as other representatives. 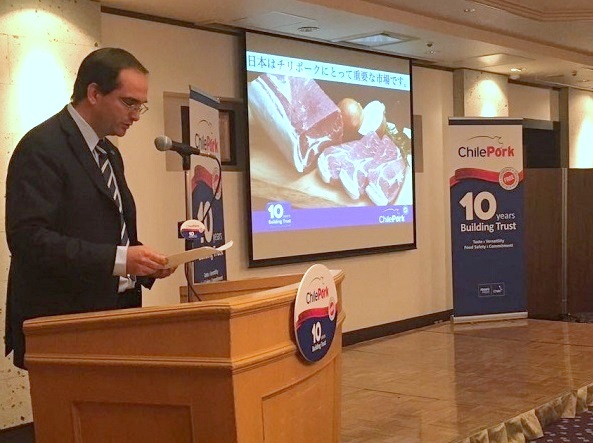 During the opening ceremony, Ambassador Gustavo Ayares noted the prestigious position won by Chilean pork since the first container arrived in Japan 20 years ago. This has been due to its high quality, food safety, and flavor, as well as the public-private cooperation that has enabled Chile to become one of the most respected food exporters in the world. “It is because we offer you a product with guaranteed quality and food safety that the value of export sales increased by 21% in 2016, to a total of US$120 million,” he added. International speaker Brett Stuart, founding member of Global AgriTrends and consultant for various organizations, talked about the economic situation and its impact on the sector, mentioning variables such as the growth of demand in China and the impact of the new government in the USA. 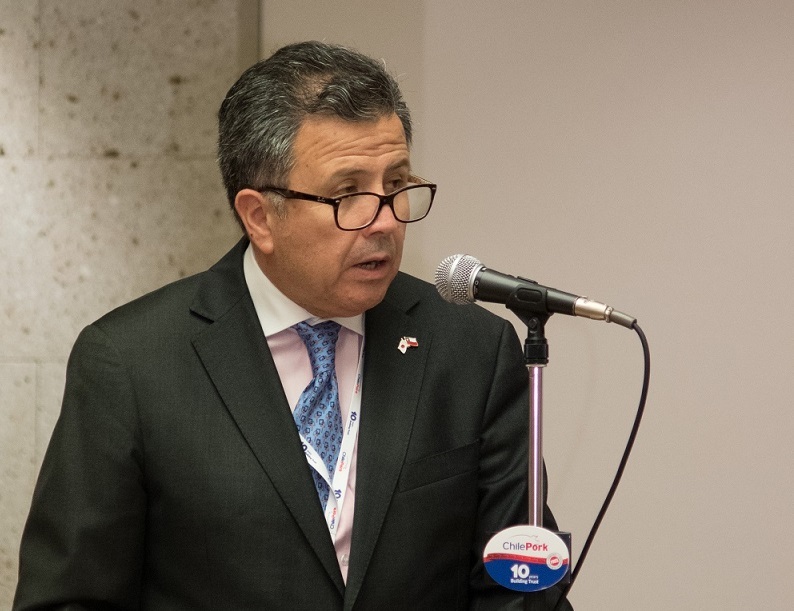 The meeting closed with the traditional sake ceremony, “Kagami Biraki”, in which the ChilePork representatives, accompanied by ambassador Ayares, broke the seals on two barrels of sake, which were then shared among the participants to bring good luck and prosperity.